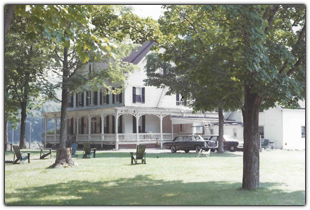 The Weyside Inn property was a working farm in the early 1800's. Robert Humphrey started the tannery there in 1835 and operated it until 1845. It was passed on to George Tuttle and then to S.R. Wey and T.C. Wey who operated the Tannery until the Hemlock ran out. The Tannery used 6000 cords of bark a year which was 3-10 hemlock trees per cord. They also operated a saw mill and a turning mill there. The Victorian was built in 1860 and became a boarding house at the turn of the century serving three meals a day. The railroad would take people to what is now the Big Indian Market and Deli. Inn keepers would use the horse and wagon to fetch their clients from there. 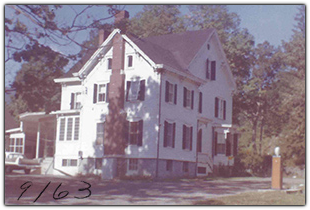 In 1946 the house was sold to Franzl and Josephine Crnkovic, who continued to operate it as a boarding house. Later it was acquired by their son Frank and his wife Doris in 1957. 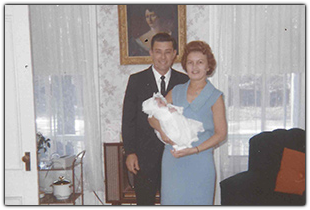 Frank and Doris ran the boarding house serving three meals a day until 1965 when little Debbie was born (pictured below with her god parents). After which they just offered breakfast. It was then the Weyside Motel. In the 1950's the lake was added and the barn was converted into two cottages by Frank Crnkovic and his father. The second lakeside cottage was added by Frank Crnkovic in the 1960`s. The Weyside Inn and Cottages was now in full swing.